For all those interested in food storage as part of their prepping activies, Shelf Reliance is currently running a Cyber-Monday sale that includes some surprisingly deep discounts. 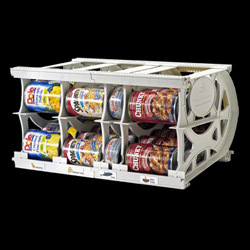 Of interest in the sale flyer is the Shelf Reliance Cansolidator Pantry on sale for $18.99 which is 58% off the normal price of $44.99! To view the entire Cyber-Monday sale flyer in PDF format, click here. You must have a PDF document viewer installed on your computer to view the flyer. The sale ends tomorrow morning at 2AM Eastern Standard Time, so if you want to take advantage of the discounts, you’ll have to act fast.